TrackYourDose App now free and non-profit! 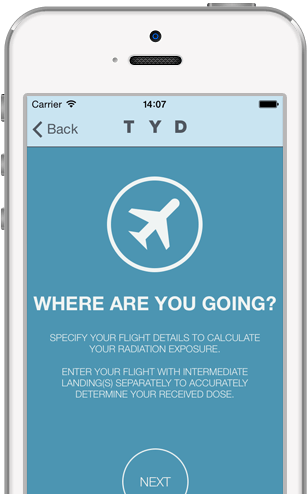 TrackYourDose is an iPhone app designed for frequent fliers, pilots, flight attendants and those who are radiation-conscious. It comes with a user-friendly interface and many features. What is the radiation at your location? How much cosmic, ionizing and ambient radiation do you receive when you are flying or getting x-rayed? 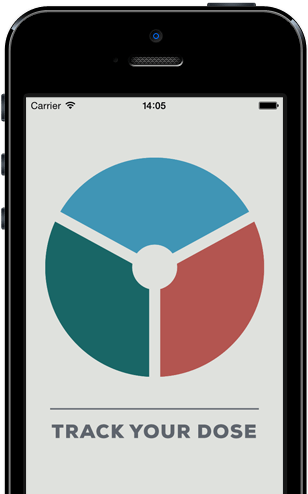 With TrackYourDose you can keep a record of your everyday exposure to radiation. Accurate calculation of your radiation exposure during flights - based on scientifically sound functions developed by PTB. The determination of natural background radiation is based on your location. Keep a record of your x-ray examinations. Easy-to-use interface, e.g. simple adding of new events. No scientific background required. The exposure to cosmic radiation is elevated at flight altitudes. For instance the dose for a flight from Paris to San Francisco is approximately 50 µSv. The natural variation of the solar activity can cause a change of up to 40 %. TrackYourDose uses scientifically validated functions developed by Physikalisch-Technische Bundesanstalt (PTB, Germany) to calculate the radiation exposure during flights. TrackYourDose accounts for the variation of the solar activity using our online database based on measurements from the neutron monitor of the University Oulu in Finland. To calculate the flight dose TrackYourDose only needs your departure and destination airport and the date of your flight. TrackYourDose calculates your personal natural background radiation and includes the most common artificial radiation sources. TrackYourDose includes a database for the terrestrial radiation in Germany and the USA. The cosmic radiation is calculated accurately for any location based on the altitude. 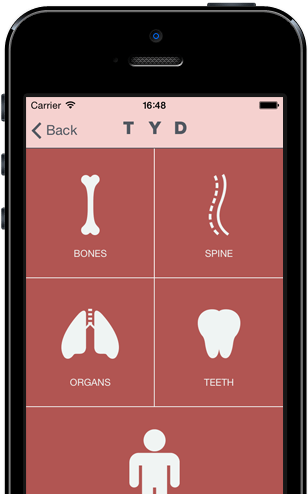 TrackYourDose uses published average values to determine the radiation dose for medical examinations. Data for artificial exposure to radiation from smoking is based on several publications. TrackYourDose has an easy-to-use interface. TrackYourDose needs only minimum user interaction to add new events. The dashboard shows a summary of your past events. Swiping it up reveals a full event history and timeline. TrackYourDose does not transfer your personal information to our server. Your location is only evaluated within the app. For requesting our solar activity database only the date of your flight (no airport locations) is send to the server. The data is not stored on our server. TrackYourDose has been highlighted in numerous international media. ...and try the exciting features of TrackYourDose 1.3. For more background information on TrackYourDose visit esooka.trackyourdose.com.